Tim Duncan announced his retirement today, after 19 seasons in the NBA. On Duncan and his impact to the game, there is no shortage of articles, retrospectives, and in-depth analyses (statistical and otherwise) from which to choose today, most pre-written, no doubt. Duncan was famous, paradoxically, for not attracting attention to himself, and his retirement announcement was no exception. Contrast Duncan's brief, matter of fact press release (not even a press conference) to Kobe's season long, air ball ridden farewell tour. I wonder how far off the Onion's version of Tim Duncan is from the real thing: Tim Duncan Raving About Health Benefits of Standing Bench, Tim Duncan Around if any Spurs Have Questions About Sequester, Tim Duncan Sends Teammates Google+ Invitations for Fifth Straight Day (I will miss the Onion's Tim Duncan almost as much as Uncle Joe Biden). But behind Tim Duncan's staid, middle of the road public persona lies a hidden deviancy: his shooting arc. Using location data tracked by the NBA's SportVU camera system, we can analyze player shooting mechanics in exhaustive detail. 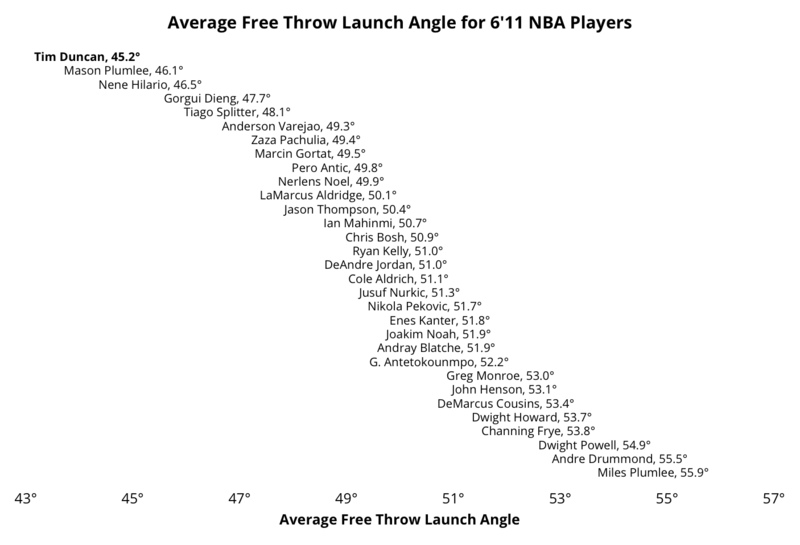 For more background, see my introductory post on this topic from last year, as well as some more recent research on free throw shooting. Duncan's at the top of this list with nearly a degree separating him from #2. Also note the disparity between the two Plumlee brothers, Mason and Miles. Mason shoots with a 46.2 degree angle, Miles with a 55.9 degree arc, yet both brothers are terrible free throw shooters. 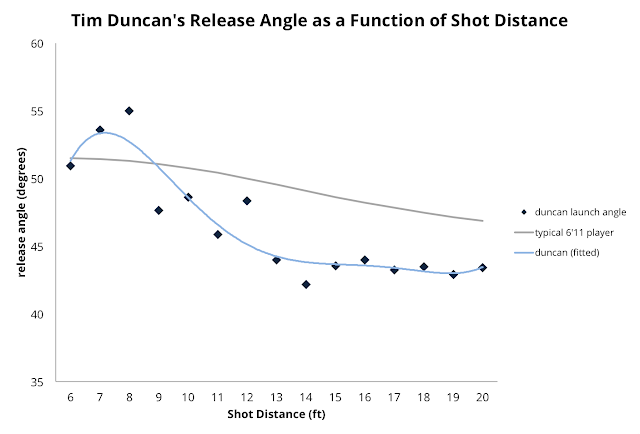 Duncan's shot arc is not only an outlier among his peers, it is practically irrational. There are tradeoffs to consider with high and low shooting arcs. The advantage of a high shooting arc is that the ball approaches the hoop at a more direct angle, making the hoop appear larger. The downside is that a higher arc also requires a higher launch velocity, which may be more difficult to control. This graph is a bit wonky and probably not intuitive, but the idea behind it is that the physics and geometry of free throw shooting constrains you to be along the horseshoe-shaped blue line. And it is up to each player to choose, either consciously, or more likely sub-consciously, what tradeoff works best for them. On the vertical axis is "effective hoop area", which is how big the hoop appears to the ball on approach (see this illustration from a prior post). At 100%, the hoop is a perfect circle (corresponding to dropping the ball from directly above the hoop). At 0% effective area you're in Flatland territory, and the hoop is an impenetrable line, corresponding to a precisely horizontal trajectory. Between those two endpoints, the hoop is an ellipse of varying width. All else being equal, a player would do better to increase their effective hoop area (bigger target = better accuracy). However, increasing your hoop area comes with a price: increased launch velocity. Note that the typical 6'11 player (annotated on the chart) is willing to accept a marginal increase in launch velocity in order to increase hoop area. But beyond that point on the graph, the tradeoff becomes punishing as the frontier gets flatter. The flatter the graph, the more you have to increase your launch velocity in order to gain a given amount of hoop area. 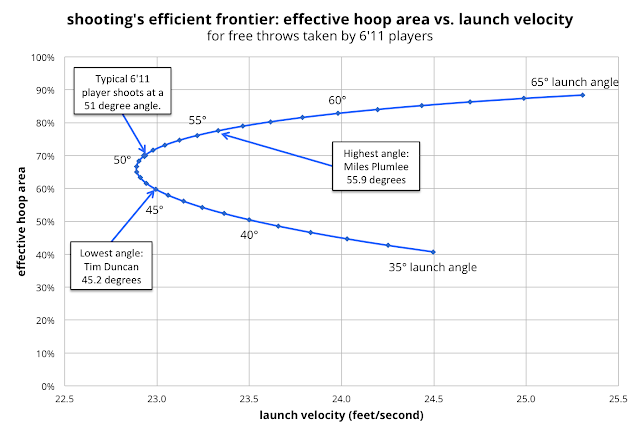 As I alluded to above, Tim Duncan's shooting arc is irrational in a very real sense, and his spot on the efficient frontier above tells us why. Duncan is on the bottom section of the frontier (aka the "wrong" side). For every spot on the bottom section of the frontier, there is a corresponding point on the upper section where you can keep the exact same launch velocity (i.e. no tradeoff) while increasing your hoop area. It's the shooter's version of free money. If Duncan increased his launch angle from 45 degrees to 52 degrees, he could keep the same launch velocity while increasing hoop area from 60% to 72%. The graphic below may help illustrate things better. 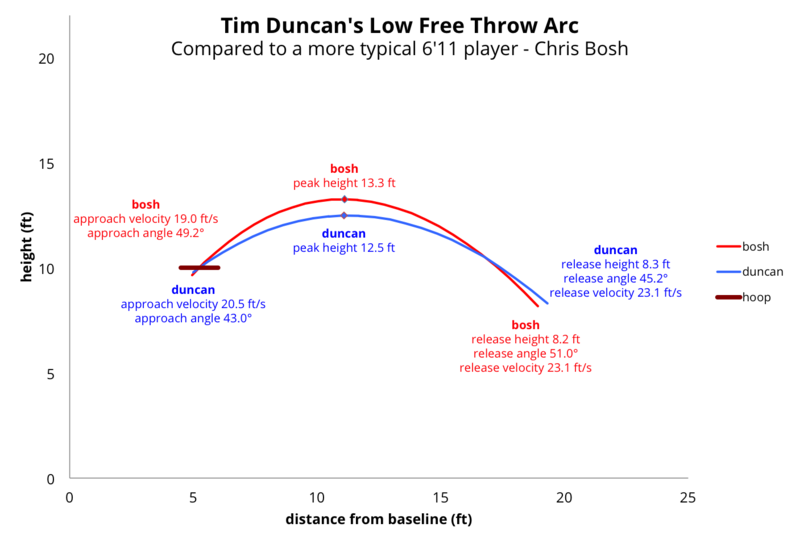 This chart compares Tim Duncan's free throw arc to that of Chris Bosh, whose free throw mechanics fall squarely in the typical range for a 6'11 player. Both Bosh and Duncan have similar release velocities (23.1 feet per second). But Bosh, by virtue of shooting with a higher release angle, has a much more favorable approach angle. A typical Bosh free throw approaches the hoop at a 49.2 degree angle while Duncan's approach angle is 43.0 degrees. The higher the approach angle, the more effective hoop area presented to the ball. As an added bonus, Bosh's free throws also approach the hoop at a lower velocity, 19.0 feet per second compared to Duncan's 20.5. A lower approach velocity increases the probability of a favorable bounce for slightly off target shots. 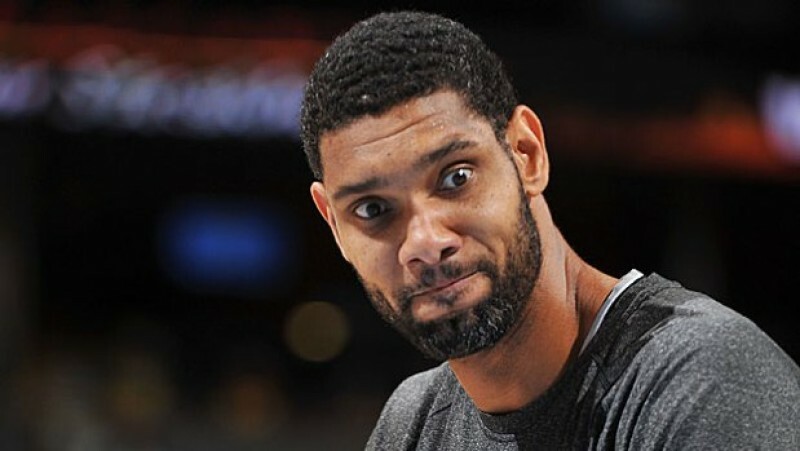 To draw a parallel back to stock portfolio theory, Tim Duncan is like an investor that stubbornly sticks with an investment portfolio even when an alternate portfolio would yield a higher expected return with no increase in variance. 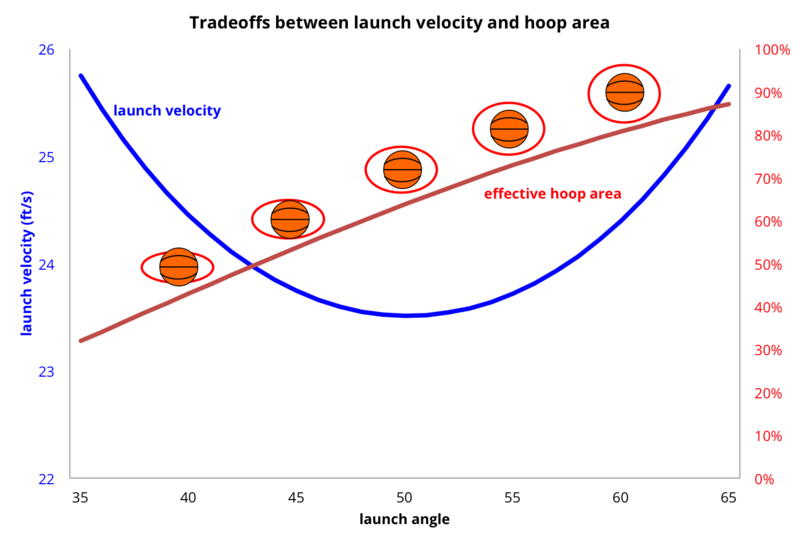 To make the analogy to portfolio theory more explicit, hoop area is equivalent to expected return (which everyone wants to maximize), and launch velocity corresponds to variance, which, in general, one tries to minimize (the Onion's version of Tim Duncan would be eating this up). Duncan's line drive approach to shooting the basketball extends beyond the free throw line and into field goal shooting in general. 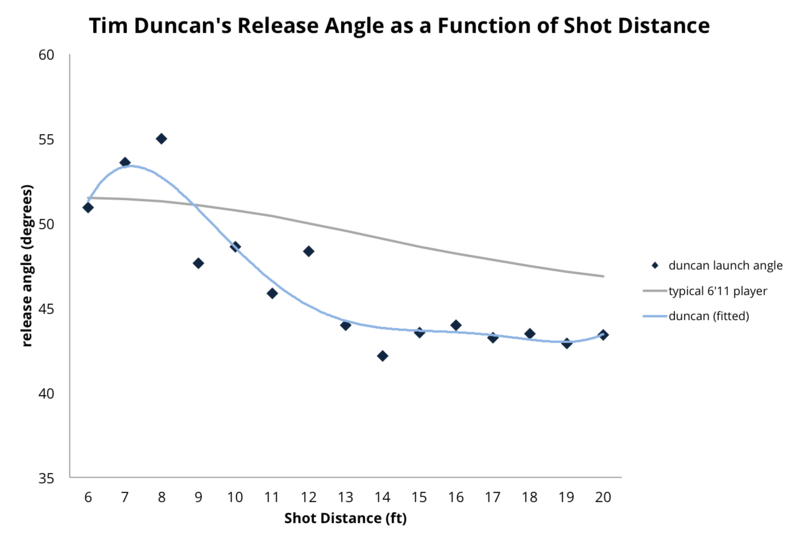 For most field goals, Duncan's release angle is a good five degrees below that of a typical 6'11 player. At close range, I imagine release angle is more a function of defender position rather than intrinsic shooter preference, which may explain the pattern for shots between 6 to 8 feet. This is all moot, of course, with Duncan's retirement. And it's not like he needed any advice (least of all mine) on how to be an effective NBA player. No amount of charts, graphs, or hand-wavy physics is going to change years of ingrained, practically hard-coded muscle memory. And based on my research, consistency is far more important to shooting accuracy than a particular choice of launch angle. I do wonder if Duncan's abnormal shooting angle was a byproduct of his late start in basketball. He was a swimmer until the ninth grade, when Hurricane Hugo and a fear of sharks forced the Big Fundamental to switch from swimming to basketball. Thank you, sharks.